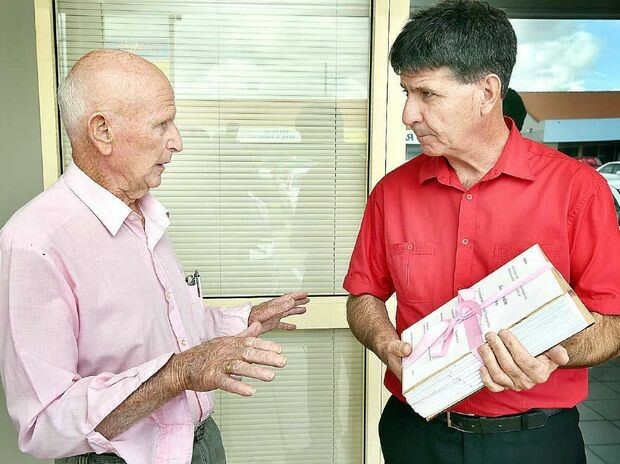 A PETITION to de-amalgamate the Fraser Coast Regional Council by having Maryborough, Woocoo and Tiaro form its own council, leaving Hervey Bay on its own, has been handed to State member for Maryborough Bruce Saunders. The petition has been signed by more than 8500 people who believe not enough is being done for the region outside Hervey Bay. Mr Saunders said the petition represented an important aspect of democracy, allowing people to be heard. But he felt that the cost of de-amalgamating the Fraser Coast Regional Council might prove prohibitive, saying it could reach up to $25 million. Clifford Thomas, who presented the petition, questioned the suggested $25 million price tag of de-amalgamating, saying it had cost the Noosa Shire Council $2.62 million to do so. He said trying to work out the cost of de-amalgamation would be irrelevant until a Transition Committee put a figure on it. Mr Thomas said Maryborough, Tiaro and Woocoo residents were concerned about having to pay for projects centric to Hervey Bay, including the Hervey Bay CBD renewal, Nikenbah sports precinct and a function centre. But Fraser Coast Mayor Gerard O’Connell said it was Maryborough and the outlying areas that were benefiting from amalgamation as, thanks to greater economies of scale, it meant bigger projects and more work could be carried out in areas across the Fraser Coast. Petition To: The Honourable the Speaker and Members of the Legislative Assembly of Queensland, The petition of residents of the State of Queensland draws to the attention of the House that the recent forced amalgamation of the Maryborough Region to Hervey Bay has failed. Rural and tourism towns are never going to gel. Neighbouring rural towns Gympie and Bundaberg are surging to prosperity while Maryborough is slowly dying. Our Councillors are unable to represent the people because of the large areas they have to cover. Your petitioners therefore request the House to De-amalgamate Maryborough Region from Fraser Coast Regional Council to Maryborough Regional Council and Hervey Bay Council, run as two separate entities. Principal petitioner: Clifford Thomas 82 John St., 4650. This entry was posted in Latest News, media stories. Bookmark the permalink. ← Proposed amalgamations – Wellington N.Z.